Objective of Choice Response Test is to audit the continuity in your response performance. 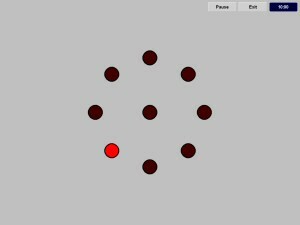 The test compiles eight lights in circular arrangement around a ninth light. According to speed settings a light from the circular arrangement will blink every second. Each light is assigned to a corresponding number on the numerical keypad of your keyboard. Whenever a light is illuminated you are to respond by pressing the number assigned to the light opposite to the one blinking.